I have an older Dodge powered motorhome that I am wanting to power a small 120-Volt AC refrigerator, along with a 10-inch color television, stereo and a gaming system with an inverter. I have hooked up a large second battery for use with the power inverter. My question is, how many watts will it take to power all four of these things? Matthew, contrary to what others may say, adding an inverter to an existing electrical system is a little more detailed than simply applying basic mathematics to determine what size inverter is required. As a start, however, add up the wattages for each device you want to power. If your appliance or device is rated in amps, multiply that amperage times 120-volts; the result will be the power measured in watts. If the wattage or amperage is not readily evident on the device itself, consult the operating literature that came with each component. Next multiply the wattage for each device times the amount of time (in hours) you’ll likely use that component each day. This will give you a more complete picture of your requirements for inverter size. Make sure that the inverter rating you choose exceeds the total wattage requirement based on your needs. There should also be a 30% safety factor added to your total requirement. 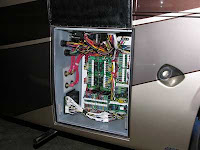 I must add that inverters designed for RV applications are available in two basic output waveform technologies: quasi-sine wave (sometimes referred to as modified sine wave), produced by low frequency transformers, and pure sine wave output inverters produced by microprocessor-controlled, high frequency circuits. Although low frequency inverters are less expensive and considered efficient devices, they are, however, prone to voltage fluctuations which can cause disturbances in some DC circuits in the RV. Pure sine wave inverters, on the other hand, are extremely sophisticated and can produce AC power at or above the quality levels of shoreline power grids. Comparisons can be made by looking at the total harmonic distortion (THD), produced by each type. The harmonic difference between the low frequency RV inverter wave form and true sinusoidal wave shape is a percentage figure that affects the operation of induction type loads such as motors, compressors, or other capacitor-started devices. The higher the percentage, the higher the heat factor; the higher the heat factor, the more damaging to the device. THD, (purity of waveform), produced by low frequency inverters can exceed 40% with some units purported to approach 47%. When the output AC is not being called for, most inverters will go into a simmer mode until the demand for power is evident again. During this downtime certain monitoring functions must continue. This results in a continuous draining of current from the battery bank. Obviously, the inverter that draws the lowest amount is preferred. Once you know your total daily requirement for power, you’ll know what size inverter to purchase. Once you know the size of the inverter, then you can effectively approximate the size of the battery bank needed to power that inverter. You may need more than just that one extra battery. You’ll need a battery bank large enough to produce the daily wattage requirement for as many days that you want to remain free from a charging source. So as you can see, it takes some math, some homework and some forethought into choosing the most effective inverter for your motorhome.